Finding the local experts for home services and local services demand was huge in this decade, so everyday living dependable conserved by the professional teams.Hence venturing a reliable home services needs website is recommended for the entrepreneurs totakeover project and get succeed in the online business. Just gear up and utilize the power of professional experts listing website like Urbanclap or Housejoy or GOJEK. We have developed experts handling website from the scratch with high end customization features. As a visitors who visits professional service Urbanclap Clone Script can feel that scratch that imitates the freshness. User can find services from search filter and view category list, under that select the any of the category which pageants members services with details.Through Housejoy Script admin can customize categories and sub categories based on the business model, as discussed site can be utilized for single local services or multivendor solutions such as beauty and saloon, home appliances, electrical, plumbing, fitness, carpentry and more. If you love the services of the local experts which you want to hire them with package list and date and time of the services availability. Also, make payments to the service experts with secured payment gateways. In the GOJEK Script user dashboard, one can manage their profile and look out the history of services obtained. If you were the local professional and enthusiastic to take part in the local services? You can right to join by clicking “Become a professional” button in the top of thecorner in Housejoy Clone Script. By proceeding with valid credential like mobile number, name, city, category, email ID and password you can be a part service expert family and all you need to get approve from the admin of the website. A professional can sort all leads by varying time and booking details respectively. With monthly or yearly plan professional can manage their subscription plan from the admin. Moreover,clear admin dashboard claims to manage visitors, users and professional experts. Salient features of admin dashboards are graphical views of booking report, total number of user counts, sellers count,customer count, booking count, total services and more. Admin can manage booking history, services and sub services to edit or delete, pending withdrawal and completed withdrawal of payment transactions. 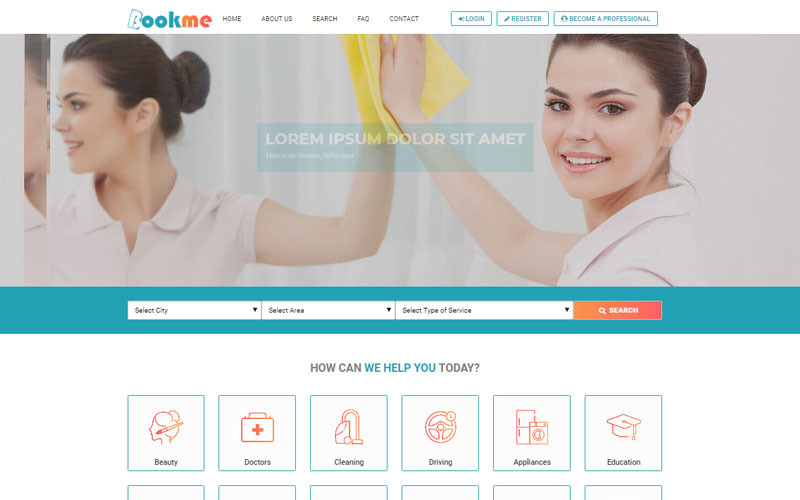 Service specialist GOJEK Clone Scripthave cleaver CMS pages and admin can add and update the company profile details through settings. CMS pages includes testimonial, service pages, shop etc. As trusted by millions, we have integrated PayPal payment as the secure transaction gateway to ensure cumulative lead generation. As discussed earlier onUrbanclap Script, we are providing end to solution for the entrepreneurs to start an on-demand service listing website with a monetary process. If you find any queries you can write us email and our tech expert get back to you in a while. Thank you very much for this wonderful marketplace website, perfect urbanclap cloning.